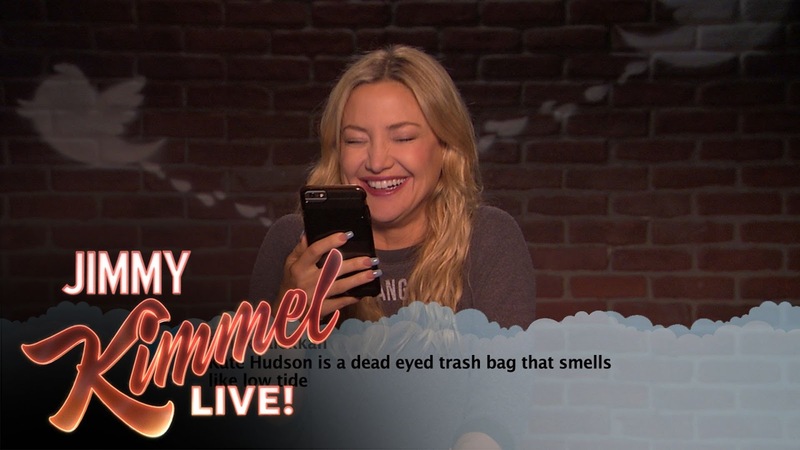 It's a 'Jimmy Kimmel Live' thing. The Internet is both a wonderful and horrible place. A place where people go to share their love and also their hate. From time to time, we call out the haters by inviting well-known people to read some of the not so nice things that are written about them. We’ve done it again for our 10th edition of celebrities reading “Mean Tweets ” featuring Hugh Grant, Kate Hudson, Greg Kinnear, Melissa McCarthy, Chris Evans, Jane Lynch, Norman Reedus, Margot Robbie, Anthony Mackie, Judd Apatow, Olivia Wilde, Paul Rudd, Ryan Gosling, Zac Efron, Wanda Sykes, Russell Crowe, Bryan Cranston and Kiefer Sutherland.